I’m going to this? Somebody pinch me, please. If you don’t mind, I’m going to bother you with a small portion of my life story. This is about my inability to win contests. Big, small, short, tall – I don’t win them. I’m pretty sure that if I was the only person to enter a contest, the contest holder would cancel said competition due to lack of interest and leave me high and dry. Now, it’s not like this keeps me up most nights, but I’m going to take you through a series of my life winnings and explain how everything turned around (hopefully…) yesterday. I first won a contest at the age of 5. My mom, sister and I went to a Barbie event (yeah, I said it. Barbie event.) where we got to meet THE REAL BIRTHDAY BARBIE, snap some pictures, beg our mom to buy us some super neon Barbie clothes and accessories and revel in all things Barbie. During the event, we were given raffle tickets. Another thing you should know about me: when I enter a contest, I go all out. Daily entries? If I can, it’s done. I get excited and always always always think this is the one – I’m going to win! I only tell a select number of people because the more people I tell, the chances of me winning slips through my fingers. Well, 5-year-old me was correct. My raffle number was called and I was a winner! A real winner of a real contest! I went up to THE REAL BIRTHDAY BARBIE to collect my prize. She beamed down at me with her poofy dress, blue eye shadow and early ’90s teased, platinum blonde hair, smiled, and handed me…a Hotwheels car. Yes, the prize at a Barbie event was a Hotwheels car. And that, my friends, is when I learned what a buzzkill felt like. The second time I ever won something was pretty recently. I won 2 tickets to “A Night with Flavor Flav” in L.A. I’ll keep this short and sweet. I live in Chicago. I would have to pay for my own flight and accommodations…for “A Night with Flavor Flav.” Needless to say, those two seats sat empty for Flav that night, bless his clock wearing soul. Then yesterday, a miracle happened. Allow me to start from the beginning. 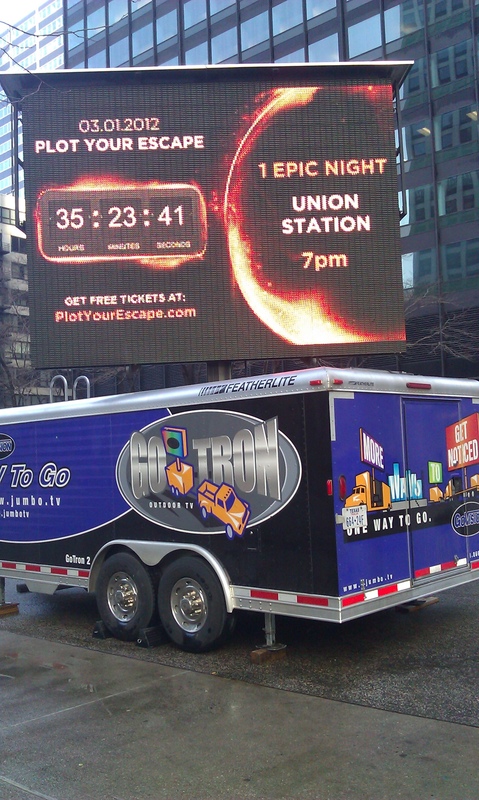 I was leaving work the other day and saw a JumboTron on top of a truck outside of my train station, saying “Plot Your Escape” with a large, blinding countdown. I made a mental note and told myself to Google it as soon as I got on the train. True to fashion, I walked through the doors and forgot immediately. Luckily for me, I received an email from my manfriend (by that I mean we’ve been dating for almost 2 years) with “Mystery Concert?? ?” as the subject. What was it about? It was about this “Plot Your Escape” madness. I went to the website and saw the following: 4 concerts. Countless Celebrities. 1 Epic Night. Also attention grabbing – tickets are free. Free?! That’s only my favorite price. Sold. Of course the artists weren’t mentioned, but the Ticketmaster event mentioned Grammy winning Artists. Farewell to an hour of productivity forever lost to Google searches, Twitter feeds, Ticketmaster browsing and constant clock watching. I learned pretty quickly that tickets went on “sale” at 11am CST for the Chicago show. So, I tried to get on with my life and work. At 10:57, I went to the Ticketmaster page, waited patiently for 11am, and somehow, someway, snatched up two of the 50 tickets for the event. I sent a celebratory text to said manfriend with exclamation points galore. I found out seconds later that I snagged two tickets to a Maroon 5 and Sara Bareilles surprise, intimate concert being put on at Chicago’s Union Station as part of a Jimmy Kimmel show. Concerts in L.A., Chicago, New York and New Orleans will be happening simultaneously and live streamed for all to see. That’s about all I know. And I can’t sit still. Well, that and this is so much more exciting than winning a Hotwheels car or a night with Flavor Flav. Expect a full recap on Friday. Tags: Cee-Lo Green, Chicago, Chicago Concert, Gavin DeGraw, Jimmy Kimmel, Mariah Carey, Maroon 5, Mary J. Blige, Nicki Minaj, P Diddy, Plot Your Escape, Sara Bareilles. Bookmark the permalink. Ann, you forgot to mention the $50 you won at the U of I poster sale. I came across your blog while I was engulfed in Google searching for more Plot Your Escape info. I giggled at how similar our lack of contest winning was! That being said, I was also lucky enough to snag 2 of the tickets. My friend also got 2 but she cant go so she generously gave them to me! Lucky me! I thought i would throw the question out there because I cant seem to find anything online… If the tickets are in my friends name, do you know if our IDs have to match the name on the ticket? I invited some other friends and I would hate to find out some of them couldn’t get in. At any rate, I hope you have a wonderful time and congrats on being one of the lucky 50! Hi Kristen – I’m happy to hear that a fellow non-contest winner was able to snag 2 (or 4!) of the tickets, as well! I’m not positive, but I have a feeling we need our IDs simply because you have to be at least 21 to attend. I’ve seen a ton for sale on Craigslist, so I’m pretty sure the names don’t need to match…otherwise, a bunch of people won’t be able to go. I’ve been doing a lot of Googling, too, and there doesn’t seem to be much info out there. I did stop by the Great Hall on my way to work today, though, and it looks amazing! Have fun and congrats to you, too! After you told me about your blog last weekend I just had to check it out- LOVE IT! Congrats on the contest win- that’s amazing! My dad called me Wednesday morning and told me about the website. He knows I’m a huge fan! I got a ticket, went, saw, and was blown away!